READ or download the full text of the Inaugural Address of President Rodrigo R. Duterte - the 16th President of the Philippines. during his inauguration as the 16th President of the Philippines on June 30, 2016. No leader, however strong, can succeed at anything of national importance or significance unless he has the support and cooperation of the people he is tasked to lead and sworn to serve. It is the people from whom democratic governments draw strength and this administration is no exception. That is why we have to listen to the murmurings of the people, feel their pulse, supply their needs and fortify their faith and trust in us whom they elected to public office. I know that there are those who do not approve of my methods of fighting criminality, the sale and use of illegal drugs and corruption. They say that my methods are unorthodox and verge on the illegal. In response let me say this: I have seen how corruption bled the government of funds, which were allocated for the use in uplifting the poor from the mire that they are in. I have seen how illegal drugs destroyed individuals and ruined family relationships. I have seen how criminality, by means all foul, snatched from the innocent and the unsuspecting, the years and years of accumulated savings. Years of toil and then, suddenly, they are back to where they started. In this fight, I ask Congress and the Commission on Human Rights and all others who are similarly situated to allow us a level of governance that is consistent to our mandate. The fight will be relentless and it will be sustained. As a lawyer and a former prosecutor, I know the limits of the power and authority of the president. I know what is legal and what is not. My adherence to due process and the rule of law is uncompromising. You mind your work and I will mind mine. However, there are certain policies and specifics of which cannot wait for tomorrow to be announced. Therefore, I direct all department secretaries and the heads of agencies to reduce requirements and the processing time of all applications, [applause] from the submission to the release. I order all department secretaries and heads of agencies to remove redundant requirements and compliance with one department or agency, shall be accepted as sufficient for all. I order all department secretaries and heads of agencies to refrain from changing and bending the rules government contracts, transactions and projects already approved and awaiting implementation. Changing the rules when the game is on-going is wrong. I abhor secrecy and instead advocate transparency in all government contracts, projects and business transactions from submission of proposals to negotiation to perfection and finally, to consummation. Do them and we will work together. Do not do them, we will part sooner than later. Prescinding therefrom, I now ask everyone, and I mean everyone, to join me as we embark on this crusade for a better and brighter tomorrow. But before I end, let me express the nations, on behalf of the people, our condolences to the Republic of Turkey of what has happened in the place. We offer our deepest condolences. 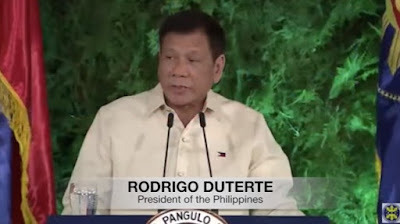 Don't forget to share the message President Rodrigo R. Duterte wants to convey during his inauguration as the 16th President of the Philippines.